Posted on March 11, 2016 | Comments Off on Ludwig Versus Guyenet: Why Are We Fat? Dr. David Ludwig and Dr. Stephan Guyenet recently debated why we get fat. Ludwig favors the Carbohydrate-Insulin-Obesity Theory. Guyenet thinks leptin plays a central role although it’s by no means the only piece of the puzzle. It’s a gross oversimplification, but let’s just call it the Leptin Theory. Guyenet published a critique of Ludwig’s proposition, then Ludwig released a response. This would be a good time to click and read the Ludwig response link unless you’re already bored. Here’s the gist of it: there are negative feedback loops between the brain and fat tissue, and between the brain and the gut. These are what regulate body fatness and appetite. 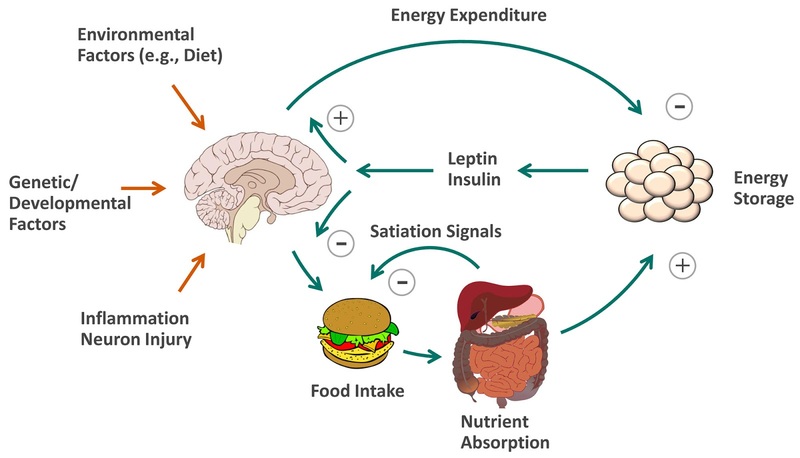 The primary known feedback signal that regulates body fatness is leptin– a fact that has remained scientifically unchallenged since shortly after its identification in 1994. Insulin plays a role as well, acting directly on the brain in a manner similar to leptin, although much less powerfully. As you can see, this model doesn’t resemble the CICO model– or the insulin model. Regulation happens principally as a result of the brain changing the number of calories entering and leaving the body (in humans, mostly entering)– so the much-maligned calorie maintains a central role in the process. Even though calories aren’t the first link in the causal chain, they are nevertheless a critical link. Most people in my field also believe that calorie intake is determined both by hunger (homeostatic eating), and factors other than hunger (non-homeostatic eating). I agree with them. Why does it matter which of the theories, or some other hypothesis, is correct? Well, if we want to cure or reverse the overweight and obesity epidemic, it might be helpful if we know the cause. Then we address the cause directly. For example, if I have a patient with fever, my treatment plan depends on whether the fever is caused by cancer, an overactive thyroid, adverse drug effect, environmental heat exposure, a broken thermometer, or infection. This entry was posted in Overweight & Obesity and tagged Carbohydrate-Insulin-Obesity Theory of obesity, cause of obesity, cause of overweight, leptin theory of obesity, why are we fat. Bookmark the permalink.